As much as Gidget liked the peanut butter banana cookies I made for her, she liked this flavor even more! Who could blame her? What dog doesn’t love peanut butter and cheddar cheese? 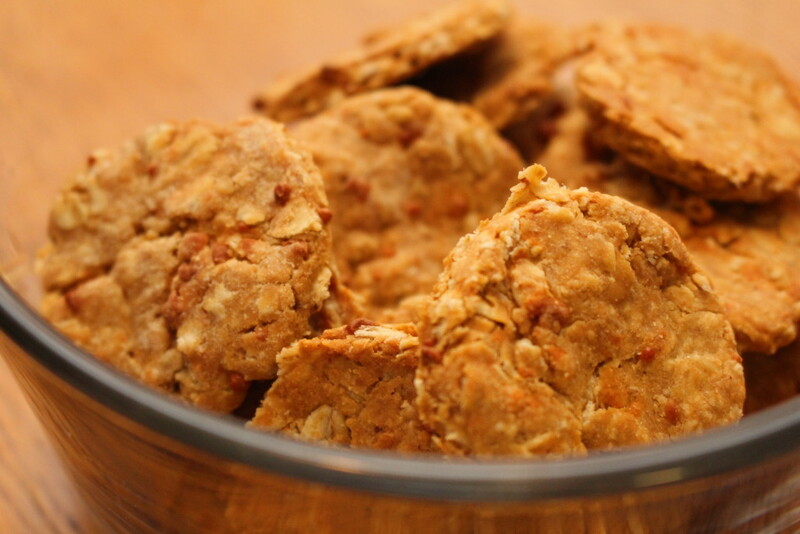 These tasty peanut butter n’ cheddar biscuits are just 6 wholesome ingredients that you can feel good about sharing with your favorite canine, when ever they deserve a special treat! In a medium bowl, combine the flour and oats. In a separate bowl, whisk together the peanut butter, banana, egg, oil, and molasses. Add the dry ingredients to the wet, and mix well with a large spoon. Knead the dough in the bowl 4-5 times, until it forms a ball. Turn the dough out onto a lightly floured board, and roll out to 1/4″ thickness. Use a 1 3/4″ cookie cutter to cut out the biscuits. Place the biscuits onto the prepared baking sheets. Re-roll scraps as needed, until all of the dough is used. Place baking sheets on the center rack of the preheated oven. Bake for 20 minutes, flip them over and bake for another 3 minutes, until they are lightly browned. Cool on wire racks, and store in an air-tight container. Until next time, may you and your pets be happy and well. Please enter your email address to receive my free newsletter, and to be included in any future offers, discounts, and free giveaways. KWilson on I’m So Happy That I Don’t Count Calories Anymore!